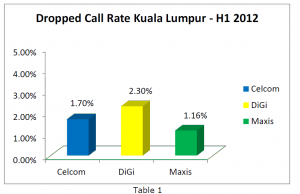 For drop calls, Digi leads the pack (which isn’t a good thing), while Maxis does best. So while they’ve received a lot of flak for the iPhone 5 services, based on the DCR–Maxis is the best telco in Malaysia (or at least in KL). It’s also interesting to note, that while Digi records the highest percentage of 2.3%, that’s still pretty decent I suspect. Although one would expect coverage in KL to be nearly flawless, the way to look at it is that the best you can get in KL is about a 1% drop call rate, or 1 drop call for every 100 calls made. Digi does twice as bad as Maxis, but it still only translates to 2 drop calls for every 100 calls made. The Blocked call rates in KL are a bit different though. Here Celcom leads the pack by a far margin (leading isn’t good in this case). Maxis is once again the best telco for the BCR, and once again does nearly twice as well as Digi. 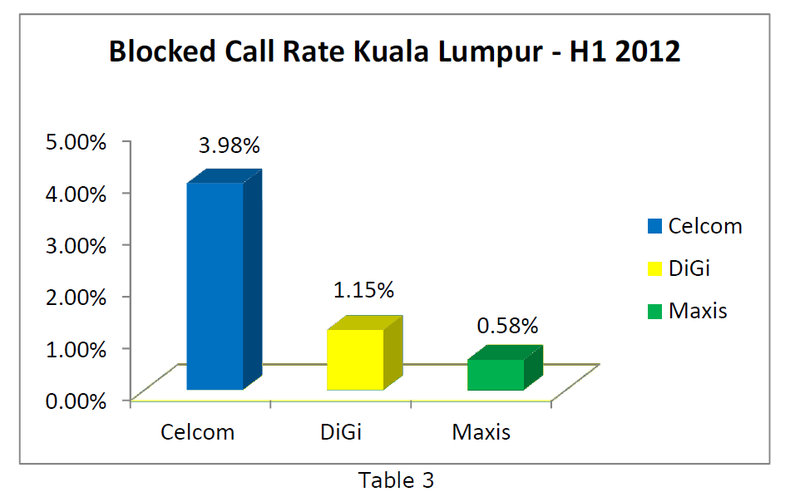 In terms of Blocked and Dropped calls–the data from the SKMM suggest– Maxis is the best telco in KL doing twice as well as Digi in both the BCR and DCR categories. What that translates to, is that as a Digi subscriber–you’re probably experiencing twice as many dropped and blocked calls than Maxis customers. That’s a LOT of difference if viewed in percentages but in absolute numbers though, Maxis experiences roughly 1 block call for every 2o0 calls made, while Digi experiences 1 for 100 calls made. 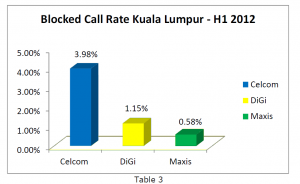 Celcom though, deserves a ‘special mention’ in this case–Celcom customers can expect to have nearly 1 block call for every 25 calls made, about 4 times more than Digi and 8 times more than Maxis. That’s bad! Based on just the data from KL (you can further analyze your home towns later), it’s very (very!) clear that Maxis is the best telco provider in KL from a BCR and DCR perspective. So if you’re looking for the best call coverage and reception in KL–look for the green telco. The question then is — whose the worst? For every 1000 calls made on a Digi Network–you’d get 23 Dropped Calls and 12 Blocked Calls. 965 calls would be ‘flawless’. 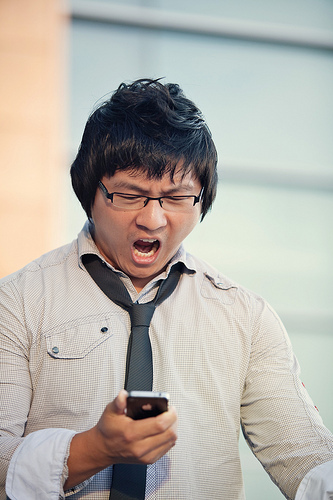 For every 1000 calls made on a Celcom Network– you’d get 17 dropped calls and 40 blocked Calls. Just 943 would be ‘flawless’. From this very simple (and hardly concrete analysis)–it would appear that Celcom (and not Digi) is the worse telco in KL. 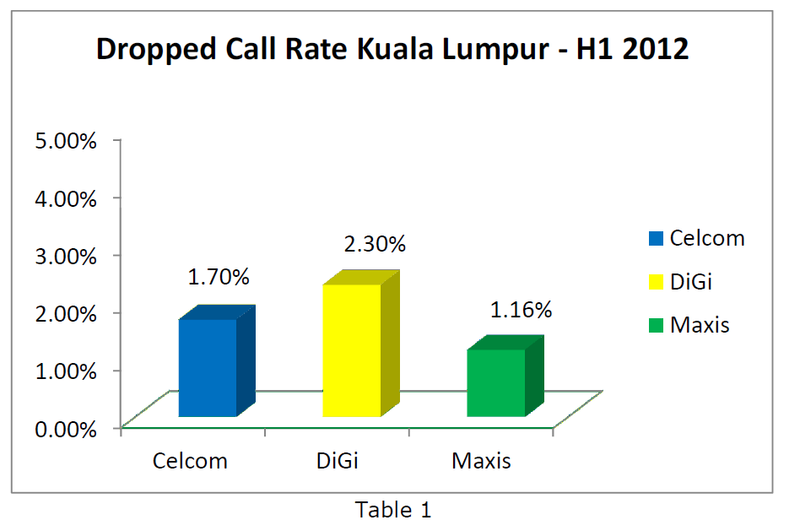 Malaysian Wireless were a bit misleading when they pointed the headlines to Digi relatively high drop call rate, while neglecting Celcoms extremely high blocked call rate. For every 1000 calls made on a Maxis Network–you’d have 12 Dropped calls and just 6 blocked calls. 982 calls could be flawless. It’ll be interesting to see the SKMM methodology of calculating these numbers. More important than where these calls were made, it’s important to find out exactly how many calls were made for the study, whether the calls were made to phones on the same network, where were the receiving nodes located (in KL, in the same car, somewhere else?) and what phones were used. While it’s good to use the study as a basepoint for comparison, until we know just how seriously the SKMM took this study, I’d be careful with extrapolating the data further. With data commanding the airwaves more than voice, it’s also interesting to find out if similar studies will be done for data downloads on the network to measure latency and bandwidth of the different telco providers in different locations throughout Malaysia. Update : I finally found the link for the QOS data from SKMM here. That’s a good one :). Especially when your boss calls you late at nights…hello boss, tut tut tut!! Let me know if it is relevant. Hi, I think the article is informative and interesting to read. However, the blocking probability depends on the ambient network load as well as the efficiency of the algorithms used by the network operator for admitting calls and managing the radio resources. So other than measuring blocking probability, a measure of ambient network load is also required. For example, one of the reasons for the high call blocking probability of nearly 4 percent with Celcom may be that the network was having a higher load when the measurements were made. It would be interesting to see a measure for network load which is simply the call arrival rate multiplied by the average call holding time (in latex equation beta = lambda*(1/mu)) for each of the network operators alongside the measured blocking probability.